Today’s posting comes from a guest blogger – The Gardener himself. We learn an important lesson about mangoes. 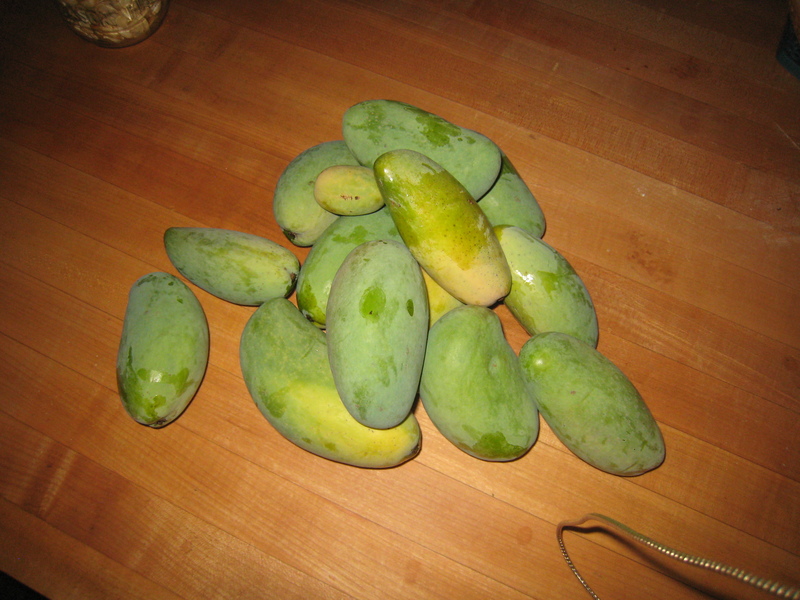 Well, for the first time, our Mango tree bore a modest crop of nice large fruit. I have gone out over several days and picked about a dozen delicious gems. Around the same time I noticed some itchy bumps starting to appear on my arms and hands. Later, my eyes started to itch and swell a bit. To make a long story short, after developing rash on several parts of my body, I remembered learning that mango trees are on the same family as poison oak. The sap contains urishiol, the chemical responsible for poison oak/sumac/ivy rashes. Luckily, it is only in the sap (including leaves and skin of the fruit) but not the fruit meat. Harvest Manager… peel me a mango, please! ← When Can You Do Something With the Squash? I need my wheelbarrow back. I can say with some conviction that the mangoes themselves are quite yummy!